The California missions played a pivotal role in the history of the Golden State. Although the region was claimed by Spain, the country showed little interest in colonizing the area until the British and the Russians appeared on the scene. Then — in what many call a defensive measure — Captain Gaspar de Portola led an expedition with Father Junipero Sera in 1769, to colonize the natives and establish a string of 21 missions along El Camino Real. The goal of the mission system was twofold — to expand Christianity among the natives, and to introduce European fruits, vegetables, livestock and ranching methods into the region. Even though many of missions are now popular tourist attractions, you can still get a quieter glimpse of colonial life along the Central California section of the Mission Trail. From Soledad south to San Luis Obispo, these four missions are pleasantly absent the cumbersome crowds that flock to the metropolitan missions. Even better, since most of the missions also operate as active churches, access improvements have been added over the years, so today wheelchair-users and slow walkers can also enjoy this slice of California history. Located 55 miles southeast of Monterey, off of Highway 101, Nuestra Senora de la Soledad (missionsoledad.com) was named for the Our Lady of Solitude. And considering the isolated location of this 1791 mission, it’s a fitting name. 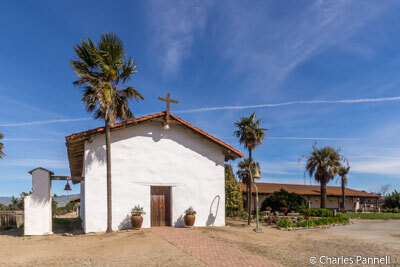 Surrounded by farmland, the Soledad mission played a integral role in the agricultural development of the Salinas Valley, as the Padres were the first inhabitants to commercially cultivate the fertile land. And by 1805 they produced 100,000 bushels of wheat per year and owned nearly 17,000 head of cattle. Today the mission still maintains its peaceful ambiance, and offers a quite respite from modern day life. Although there are no striped spaces in the dirt parking lot, an accessible space on an asphalt pad is located near the chapel. There is level access over a paved pathway through the garden to the chapel. Inside, Our Lady of Sorrows, dressed in black occupies the niche above the altar, and the original stations of the cross adorn the walls. There’s also level access to the museum behind the gift shop, which presents a chronological look at the inhabitants of the area. Each room looks at a different period, from prehistoric times to the present day. Artifacts include Native American tools and baskets, the original mission bell which was cast in Mexico in 1799, and an interesting exhibit about what happened to the property when the mission was sold in 1823. Outside there are picnic tables with movable benches on a dirt pad. There is also a shaded picnic shelter, but there is a three-inch curb around it. Additionally, there are accessible restrooms on the far side of the parking lot. Located about a half-mile off of Highway 101 in Jolon, San Antonio de Padua (missionsanantonio.net) was the third mission founded by Father Serra. Originally the missions were located a days journey from one another, but with modern transportation it’s only about a 45-minute drive from Soledad to Jolon. It’s a bit tricky to find as you have to go through Fort Hunter Liggett, but the gate is not manned and through traffic is permitted. Named for a saint known as the “miracle worker”, this 1771 mission is currently undergoing a massive renovation, which is expected to be completed in 2017. Accessible parking is available on a cement pad, near a level dirt pathway to the courtyard behind the church. A level cement pathway skirts the courtyard, and the historic drawings on the buildings surrounding the courtyard are definitely worth a look. Don’t miss the church, which is known for its campanario and archway bells and is filled with 18th century paintings. There are three steps up to it from the courtyard but the front entrance is ramped. Unfortunately the front entrance is locked during the renovation, so inquire in the gift shop if you can’t manage the courtyard entrance. A few tables with movable benches are located near the courtyard, if you’d like to stop for a quiet picnic lunch. Indeed the peaceful ambiance and the remote setting of this mission make it a must-do, even during the renovation. San Miguel Arcangel (www.missionsanmiguel.org), which is the next stop along the Mission Trail, is just a 45-minute drive south on Highway 101. There’s accessible parking in the paved lot, with level access through the courtyard to the gift shop and the accessible restrooms. There’s level access to the small museum which is adjacent to the gift shop, and barrier-free access around the exhibits. Artifacts include Native American baskets, antique weapons, and historic photographs. There’s also an interesting exhibit about the history of the mission grape, which is still grown in California today. Top it off with the original tank that the Padres used for wine storage, and you have a very comprehensive look at mission life. The self-guided tour continues out back, with level access past the sheep gate, where the flock was herded into the quadrangle for shearing. There’s a wide door into the kitchen, but the uneven floor tiles make it a bit of a challenge for wheelers and slow walkers. Still it’s worth a look if you can manage it, as the exposed-beam room also contains the Padre’s bedroom, as well as the sala which is filled with religious paintings, vestments statues and other historic artifacts. Don’t miss the 1816 church, as it still has the original hand-painted walls, which are considered some of the best preserved historic murals in the state. There’s level access to the church and barrier-free dirt pathways through the graveyard next door, which has graves dating back to 1798. The mission bells in the campanario behind the church are also worth a look, but it’s best to drive around back to see them, as there isn’t a accessible route from the church. San Luis Obispo de Tolosa (www.missionsanluisobispo.org) is the last stop along the Central California Mission Trail; and although it’s only a half-hour drive from San Miguel, its located in a significantly more urban area, in the middle of a college town. That said, it’s still worth stop for both the architecture and the historic artifacts. 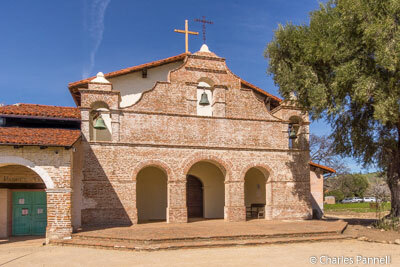 Founded in September 1772 by Father Serra, the mission was named for Saint Louis, the Bishop of Tolouse, France. Although there is a lot of street parking around the church, accessible parking is available in the lot behind the church on Palm Street. From the parking lot there’s ramp access up to the museum and gift shop, with barrier-free access around the exhibits. Although the museum is small it’s filled to the brim with Native American artifacts, period dresses and dishes, antique tools and a treasure trove of historic California photographs. The church, which has been lovingly restored, is also worth a peek. There’s level access to the building through the back garden, which is adjacent to the parking lot. Don’t miss the illuminated painting of Our Lady of Refuge, which is located in an alcove on the right side of the church. 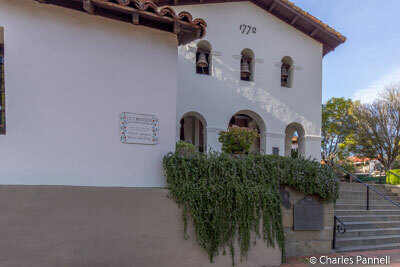 It should also be noted that neither the church or the gift shop are accessible from Mission Plaza, as there are 12 steps that lead up to the front entrance from Monterey Street. 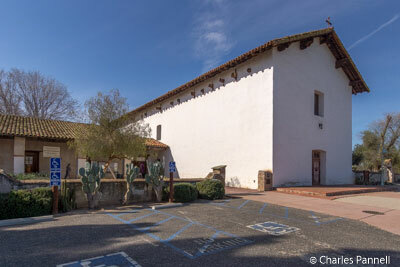 That said, the front facade of the church is definitely worth a gander, so take the time to stroll down Chorro Street from the church parking lot, for another view of this historic California mission.